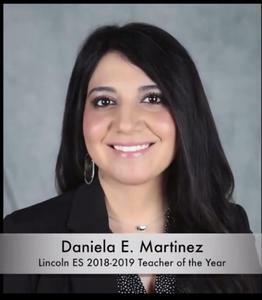 “A good teacher can inspire hope, ignite the imagination, and instill a love of learning.” These qualities affirm the mantra that has guided Daniela Martínez her thirteen years as an elementary school teacher with the Edinburg Consolidated Independent School District. Daniela was an exceptional student at her Alma Mater at Edinburg High School where she was ranked among the top five students of her graduating class. Her parents, Juan Antonio and Hilda M. Martínez instilled upon their three daughters the importance of education, high moral standards, and family values. Daniela received her Bachelor’s Degree in Interdisciplinary Studies Bilingual Generalist-Spanish in 2005 and further her educational career receiving a Master’s Degree in Bilingual Education in 2015 from The University of Texas Pan-American. Daniela is a dynamic and innovator educator who is able to find a unique way of teaching difficult concepts to students with diverse learning styles. Teaching comes naturally to Daniela and it is her life’s passion and mission to help students achieve success!